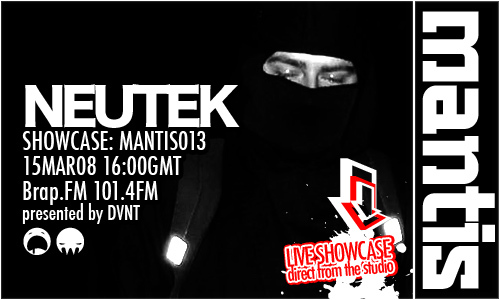 NeuTek produces his music using trackers and customised sound equipment and records an exclusive live and off-the-cuff set for Mantis Radio. The set I made was done in the early hours of Friday morning when I’d had no sleep. The equipment I used was from the following: GP2X F200 (handheld korean console) running piggy tracker with a homemade midi out running through a Freebass 383 and a midi modified glitched speak and math. I also had my laptop running Linux OS debian with a custom low latency kernel and running Jeskola buzz tracker / Aldrin tracker. Everything from here was running through a Korg Kaos pad and an Alesis Bitrman to make it extra crunchy and glitchy in places. This mix consists of old and new tracks, just stuff I felt like playing at the time. I find it hard to do mixes as I make tracks individually so mixing them is a strange concept for me as I can’t imagine mixing the different feelings. It’s not as though my tracks are about just what you hear. It’s the picture and feeling it gives me what other people ‘ get coz it doesnt have any other attachment other than the sound. Present and passed for events is strongly Midlands based around Nottingham working with Kombination Funk, Futureproof and always the guys from Lobotomy. People should look out for the gig in Shoreditch 31st May as I will be doing a street rave with some handheld equipment via the boombot sound system. Future projects are mobile laser projections, augmented reality controllers using my own input and the crowds. ASCII / ANSI art visuals using Perl. and always more tracker & scripting based music. NeuTek is going to be our headliner for the neuroMANTIS night on 31st May in London. Unfortunately due to getting a last minute ticket for BLOC weekend, NeuTek only had time to produce a half hour of sound. The set I made was done in the early hours of Friday morning when I’d had no sleep. But what a wall of sound he presented. Feedback from the radio listeners compared it to Autechre and in the final few minutes it went nuts and was proper evil Aphexness. NeuTek produces the music using trackers and customised sound equipment (check the tracklistings for a blurb/equipment rundown for the geeks out there). Either side of the short but damn sweet liveset DVNT offered up some tasty treats. 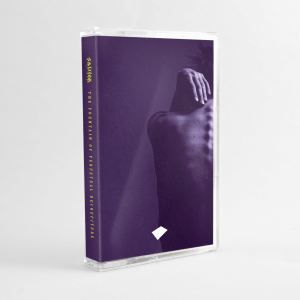 Starting in the ambient, sound scaped lushness of Letna and a mysterious 7″ that arrived from Finland, courtesy of Jari Pitkanen. You also heard some Ekaj, Takomo, new Combat Recordings from Point B, forthcoming r3tox with Jay Pace, Midi Miliz, Skeetaz, fresh Jnr Hacksaw and some immenseness from the Lawgiverz (who were showcased on Mantis Radio 012).